Only a smattering of Washington State breweries won medals at this year’s World Beer Cup competition in Colorado. As the proliferation of craft breweries continues unabated, there’s more and more competition each year from all across the nation and the World. This year’s competition had 4,754 entries from 1,403 breweries, representing 58 different countries. That’s a lot of competition! Each medal won at the World Beer Cup is a badge of honor for the winning breweries, proclaiming to the World that their beers are considered some of the best available on this small, blue marble we call Earth. ‘Best’ is always subjective, of course, but it’s nice to be recognized by your peers for all the hard work that goes into your brews. The craft beer scene in America, and indeed across the Globe, just keeps growing and evolving. It’s been amazing over the years to watch craft beer’s continued growth, taking more and more market share from the ‘big boys’ of brewing every day. The tastes of today’s beer drinkers are evolving as well, and new craft breweries are popping up just about everywhere to satisfy that demand. 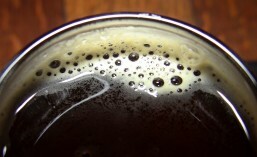 The same old bland, boring, mass-produced lagers just aren’t cutting it for more and more beer drinkers every day and, for craft breweries, that’s a very good thing. Craft breweries everywhere, including right here in Washington, are reaping the rewards of their labors. One of those breweries, Airways Brewing Company (CBM Sponsor), is gearing up to celebrate their first World Beer Cup win this Thursday, April 24th at the Airways Brewing Company Brewery & Taproom in Kent. 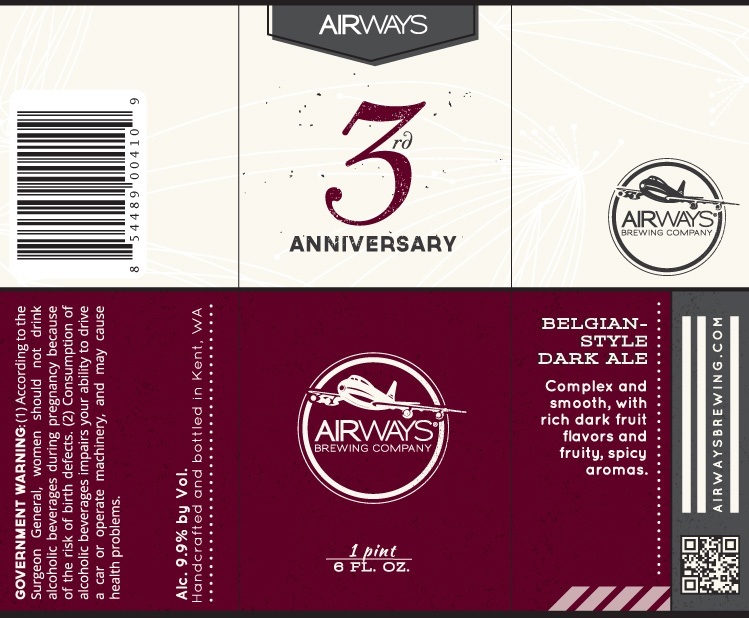 Airways won a Silver Medal for their 3rd Anniversary beer; a Belgian Style Dark Strong Ale. Congratulations! Every two years, in conjunction with the Craft Brewer’s Conference, thousands of beer samples are sent to be judged as part of the World Beer Cup, one of the largest and most prestigious beer competitions in the world. This year saw 4,754 entries from 1,403 breweries representing 58 countries. 281 medals were awarded in 94 categories, and we’re happy to say that our 3rd Anniversary beer won a silver medal in the Belgian Dark Strong group! We received one of eight medals that went to Washington breweries. That’s quite the honor for our little brewery in Kent, and is a reflection of the hard work many people have put into building Airways. We wanted to say thank you to all of our loyal customers, employees, investors, and community for believing in us over the past four years. We hope you’ll join our celebration at the Tap Room from 3-9 pm on April 24th with complimentary citrus trifle made with Finnriver pear brandywine and raspberries from our Bistro. Head brewer Alex Dittmar will be there to pour samples from one reserved case of the winning beer while it lasts and hand out raffle tickets to all attendees (no purchase necessary). At 7 pm, Alex will buy the winner the last remaining growler of our Very Loud Lady Triple IPA, which will not be brewed again until next February. In addition, we will be donating 10% of Tap Room pint sales from that night to the Kent Food Bank. Thursday, April 24th, 2014 from 3-9 p.m. This event is open to the public; Airways Brewery & Tap Room is a 21+ establishment. Founded in Spring 2010, Airways Brewing Company is a growing microbrewery located in Kent, Washington. Currently producing several year-round and seasonal offerings—including Sky Hag IPA®, Chocolate Stout, Pre Flight Pilsner™, Maylani’s Coconut Stout™, and PSA® Summer Ale—Airways Brewing also features limited edition and cask beers throughout the year. Pints, tasters, bottles, cans, and growler fills are available at the brewery’s Kent Tap Room, open Tuesday–Wednesday from 3–8 pm, Thursday–Friday from 3–9 pm, and Saturdays from 3-7 pm (6644 S 196th Street, #T-100). Pints, packaged products, and delicious Northwest-style food can be found at the Airways Brewing Beer & Bistro in downtown Kent, Sunday–Thursday from 11 am–9 pm, and Friday–Saturday from 11 am–10 pm (320 W Harrison). Offerings from Airways Brewing can also be found in specialty bars, bottle shops and restaurants throughout Western Washington. Come on down to Kent this Thursday to congratulate Airways Brewing on their World Beer Cup win and to help them celebrate. As noted above, Airways Brewing’s Head Brewer, Alex Dittmar, will be on hand to pour samples of the winning beer form a reserve case – while it lasts. Don’t be late if you want some. This entry was posted in Anniversary, Awards, Beer, Belgian, Brewing, Events, Kent, Spring, World Beer Cup and tagged 2014, Airways Brewing, Anniversary, April, events, Kent. Bookmark the permalink.